Who but a naturalist would choose the Bearded Vulture for subject matter? And who, for that matter, would hang it on their living room wall? Known primarily for his church decoration, Johan Thomas Skovgaard attended The Royal Danish Academy of Fine Arts during 1907-11, a pupil of Viggo Johansen. He later worked with his uncle Niels Skovgaard, and assisted his father Joakim Skovgaard, decorating the Viborg Cathedral in 1912. J.T. Skovgaard is also recognized, however, for his paintings of birds, though not in the familiar Audubon-like rendition. 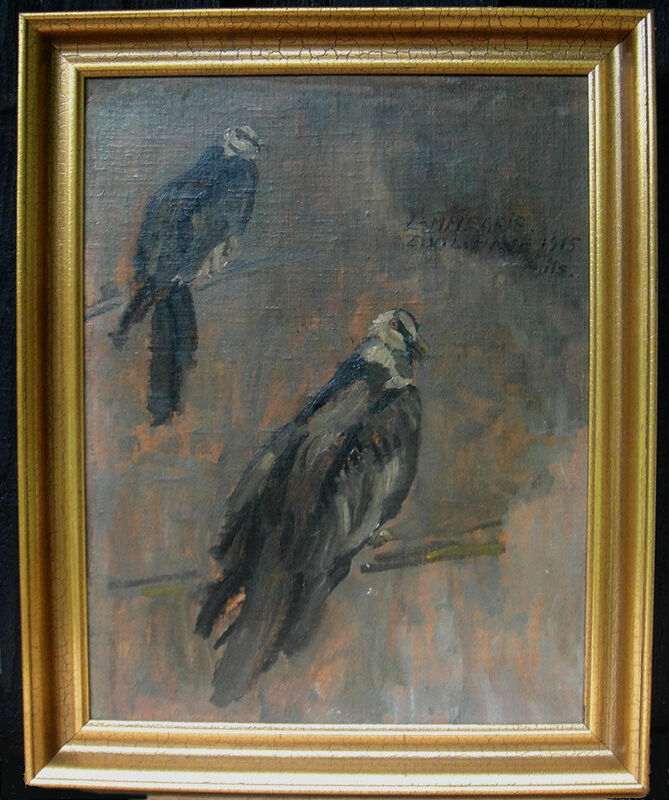 This 1915 work shows two impressionistic vultures in the Copenhagen Zoölogical Garden. He would continue to work for another sixty years. The Community Collection can be viewed in several different ways, each of them equally artificial. Presented chronologically, they represent a mini art history, a sequence of styles. Grouped by medium, a different story is told; by subject, they reveal yet another aspect. Perhaps a more insightful perspective comes from the order of their acquisition, in which case this is one of the most recent. It was given in 2012 by the children of Virginia Lawton, long-time science teacher at Fennimore County High School, as a memorial. Skovgaard’s painting had hung in her classroom as testament to the balance of Nature. By agincourtiowa in Landscapes & Livestock, Uncategorized on Monday/09/December/2013 .